For the last 10 years major national media outlets have been buzzing about Detroit's "surprising," "unexpected," "burgeoning" food scene. It started with the New York Time's annual filing of the SLOWS Bar BQ story. There were a handful of other dining media darlings that garnered a lot of national buzz, particularly as the personal stories of scrappy DIY business owners opening passion projects in the midst of a sinking city dovetailed nicely with the developing "Detroit on the rise" narrative. A lot of it sounded like an echo chamber of rebranding hype. And, to a certain extent, it still sometimes does, except that the hype has willed itself into reality and Detroit's food scene -- and art scene, and startup scene, and real estate scene, and so on -- is booming by just about anyone's standards. National Geographic named it one of "6 Unexpected Cities for the Food Lover" in the world in early 2017. The New York Times has continued to regularly check in, and named Detroit one of "52 Places to Go in 2017." Zagat named it one of the "26 Hottest Food Cities of 2016." In 2016, The Washington Post ran an article stating, "One of the country's poorest cities is suddenly becoming a food mecca," calling out the glaring juxtaposition of a notoriously poor city full of trendy dining and drinking hotspots right in the title. Which is funny, really, because prior to this the dominant narrative was "Detroit as one of the worst food deserts in America." Then it pulled a 180 and became "Detroit as a worldwide leader in the local foods and urban agriculture movement" and "Detroit as one of the hottest emerging food cities in America." A lot happened between 2007 and 2012 that contributed to this drastic narrative shift, and much of that had to do with a furious flurry of real world development that was, ironically, the direct result of the catastrophic recession. The "food desert" label was dubiously applied anyway, but as newly self-reliant entrepreneurs (who turned mass unemployment into a widespread opportunity for new careers and a new local economy) began growing produce and starting urban farms, launching cottage industry food businesses (a boon to the local food economy when the law was changed in 2010), and opening the restaurants and bars of their dreams (because why not), the "food desert" narrative -- much beloved by the click-dependent, car-wreck-gawking major media that had been feverishly writing Detroit's obituary -- was no longer sustainable. What is a Food Desert? And is Detroit One? For as many outlets that described Detroit as one of America's worst urban food deserts, just as many local journalists decried the "food desert" label, calling it a "myth" and pointing out that the city doesn't lack full-service grocery stores -- figures published over the last 10 years put the total number of full-service grocers in the city somewhere between 77 and 155 -- it just lacked major chain grocery stores at that time. The USDA defines a "food desert" as an area lacking access to fresh produce and other healthful whole foods due to a lack of access to supermarkets or large grocery stores, and the emphasis here is important. For an urban area to qualify as a “low-access community,” there must be a poverty rate of 20 percent or more with at least 500 residents in the area, and 33 percent of the census tract's population must live more than one mile from a supermarket or large grocery store. Not surprisingly, the term has proven to be controversial. An excellent analysis published in 2015 by Dorceta E. Taylor, Professor of Environmental Sociology at the University of Michigan, and Kerry J. Ard, Assistant Professor of Environmental and Natural Resource Sociology at the Ohio State University, pointed out that, "Studies that identify only supermarkets and large grocery stores miss a variety of small food outlets that carry healthful food that urban consumers desire, including independent grocers and small ethnic grocery stores." While numbers are wildly varied, Data Driven Detroit put the number of full service grocers in the city at 115 in its "Food for Thought" report in 2011. And that was before Whole Foods famously opened a location on Woodward in the heart of Midtown (to MUCH ado and ballyhoo of both the positive and negative varieties) and Michigan-based megamarket chain Meijer opened one store on the city's underserved 8 Mile border and another on Grand River Avenue on the city's west side. The allure of Detroit is that it is a place where you can be a part of something and "make a difference." It has been just four years since that Whole Foods opened, but Detroit's food ecosystem has changed dramatically in that time, earning a lot of national press for its "under-the-radar" food scene. As Detroit's post-recession low point led to a level of billionaire investment only made possible by the bargain-basement prices that very same recession wrought, restaurants, cocktail bars, breweries, distilleries, coffee roasters, and all of the other favored lifestyle accouterments of the moneyed Millennials now moving in began popping up like wildflowers in an empty field. Cheap real estate propelled these developments more than anything else, but time and time again, fledgling restaurateurs and chefs relocating from the coasts echoed the same sentiment: the allure of Detroit is that it is a place where you can be a part of something and "make a difference." The appeal of not only pursuing their dream of opening their own restaurant but also becoming an active changemaker in a struggling city that was rapidly rebranding itself attracted a lot of business owners who saw themselves not just as individual actors, but as players working together as part of a greater mission. While that narrative could get a little hokey, and those giving lip service to it were occasionally of questionable sincerity, the majority of leaders in Detroit's growing food ecosystem were committed to making good on their promises of being about the community. But the most noticeable shift that occurred as these "Detroit 2.0" restaurants began opening at a breakneck rate is that an overwhelming majority of them have loudly and proudly made the commitment to source as much locally as possible -- not just from Michigan farms and food producers, but from those based specifically in Detroit. Not just growers and farmers, but also producers of everything from granola and baked goods to beer and spirits. Hyperlocal sourcing has become such a dominating force in "support local" mobilization within the local food and beverage industry that to not do so -- and also list the provenance of locally-sourced items right there on the menu -- would be an egregious faux pas. During that same time period (starting a few years before Detroit became a popular "brand"), an urban agriculture movement was well underway, transforming Detroit's many square miles of vacant land into urban farms and community gardens -- some for-profit, others projects of nonprofit organizations solely for the benefit of their immediate communities. Urban farming isn't just a way to make a living, but a "model for a new way of living." 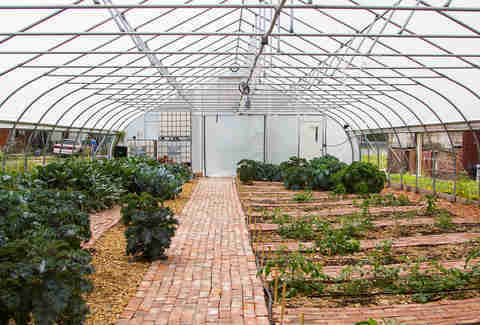 Ashley Atkinson, co-director of Keep Growing Detroit, said that there is now a network of over 1,400 farms and gardens in the city. When they launched their first program in 2004, that number was 80. While the well-documented 40 square miles of vacant land make urban farms and gardens a matter of food justice and food sovereignty in a city that may or may not be an arid food desert, those locations are also a matter of economic development. Erin Kelly, a landscape architect in the city’s Planning and Development Department, said that the industry has an important role in Detroit’s future for both land use and the business sector. 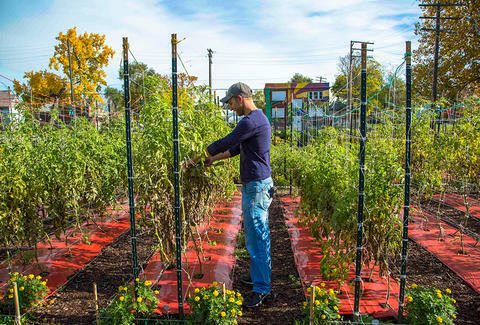 The Michigan Urban Farming Initiative formed in 2011 on Detroit's North End to redevelop three acres of vacant land into a center of urban agriculture. The all-volunteer nonprofit organization "uses agriculture as a platform to promote education, sustainability, and community while simultaneously reducing socioeconomic disparity," functioning as a source for everything from employment skills training to community food resource. And in the last year they launched what they are calling "America's First Sustainable Urban AgriHood," a mixed-use urban development with agriculture as its centerpiece. With a similar focus on employment skills training, Recovery Park Farms launched in 2012, transforming vacant land into vibrant farms and providing job opportunities to people with barriers to traditional employment. And these are just some of the newer organizations doing such agriculture-meets-social justice work: the Detroit Black Community Food Security Network's D-Town Farm, the Capuchin Soup Kitchen's Earthworks Urban Farm, the Georgia Street Community Collective, and Keep Growing Detroit have all existed for years prior to that. For other established farms like Brother Nature Produce, urban farming isn't just a way to make a living, but a "model for a new way of living." The urban farming movement has been so strong and so popular that even major corporations have taken part. The Lafayette Greens gardens were started in 2011 by Compuware in a half-acre footprint of where the Lafayette Building once stood, and were taken over by the nonprofit organization Greening of Detroit in 2014. 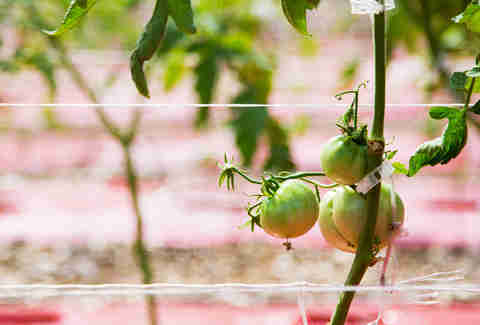 The DTE Energy Farm is a program between Gleaners Community Food Bank and DTE Energy, with 10 gardens located throughout the greater metro Detroit region on land that was previously vacant. Developers are also working with city and state government and area residents to integrate community gardens into housing developments. Keep Growing Detroit is even partnering with the MGM Grand Detroit on the 1.75-acre Plum Street Market Garden, where the organization is able to model production-focused urban agriculture while training growers, cultivating and sharing resources, supporting Grown in Detroit growers, and engaging volunteers. With this preponderance of urban agriculture, the city has also seen significant growth in the number of farmers’ markets available -- not just Eastern Market, the largest historic public market district in the United States (which has been instrumental in shaping Detroit's food ecosystem and has undergone monumental transformations over the last decade), but small "neighborhood" farmers’ markets in Brightmoor, Corktown, Islandview, Northwest Detroit, and more. New major supermarkets, neighborhood farmers’ markets, and an abundance of urban farms and community gardens are not the only factors in reducing Detroit's food security and food access issues. The Detroit Economic Growth Corporation's Green Grocer Project was launched with a $500,000 seed grant from the Kresge Foundation in 2010. It provides technical assistance, loan funding, and a façade improvement program to support Detroit's 77 full-service grocers. The project also organized events like grocery store tours to help educate communities on the variety of products available locally. SEED Wayne is a project of Detroit's Wayne State University, and works in partnership with community-based organizations on building a sustainable food system, integrating teaching, research, community engagement, and operational management as a function of its educational programming. But still there is that "lack of access to supermarkets" stigma, and the reality that, yes, if a family lives more than a mile away from the nearest major grocery store but has dozens of the some 1,700+ small grocers, convenience stores, gas stations, liquor stores, pharmacies, dollar stores, delis, and bakeries within walking distance, they might just be getting their household groceries from one of those "fringe food" businesses. Which is why Val Waller and Noam Kimelman launched Fresh Corner Café in 2011. It began as a school project, but evolved into a mission-driven food service provider with the goal of making affordable, high-quality, healthy meals available to more Detroiters utilizing the city's expansive network of convenience stores. It started with the idea of bringing fruits and vegetables into corner stores and convenience stores where the only food options are typically unhealthy hot foods (like pizza and hot dogs) and shelves of junk food. It then switched to selling their own freshly-made wraps and sandwiches, and the business has grown from there. Kimelman told Urban Innovation Exchange, "I think one of the major assumptions we had coming in is that Detroit is a food desert. We overestimated the extent of the food desert in Detroit. There are really close to 100 grocery stores in the city, and while they are not all high-quality, a lot of them carry fresh produce. So the issue wasn’t necessarily access to healthy foods but maybe convenient access to quality foods. We bring the café experience to corner stores across the city, hence ‘Fresh Corner Café.'" He described the business as "a logistics and marketing company delivering fresh and healthy food." In the years since it launched, they have learned many lessons about how to financially sustain an operation that delivers perishable, ready-to-eat fresh food products to dozens of corner stores, party stores, gas stations, small grocery stores, and cafés several times each week. And that included a lot of on-the-ground footwork by the founders themselves. Waller told Conscious Company Media that one of the biggest and ongoing hurdles they have faced was that people just don't expect to see the types of products they offer in their selected retail spaces. "Changing the social schema connected to these places has been difficult, so we opted to initially focus on creating a 'store-within-a-store' concept. This has worked for the most part, but we also felt that shifting the perception of these spaces will never happen with that tactic alone," she explained. "We’ve overcome this perception challenge by being more active in these retail spaces. We give out free samples so that people can taste the food and see a face behind the products. A lot of our progress has been about relationship building and, because we are small, we can take the time to meet people and curate good experiences with our products." In order to continue with the mission of making fresh foods accessible in low-income neighborhoods, they also had to offset that work by providing workplace and catering services in wealthier neighborhoods, which has since become "an important part" of their business. So the issue wasn’t necessarily access to healthy foods but convenient access to quality foods. 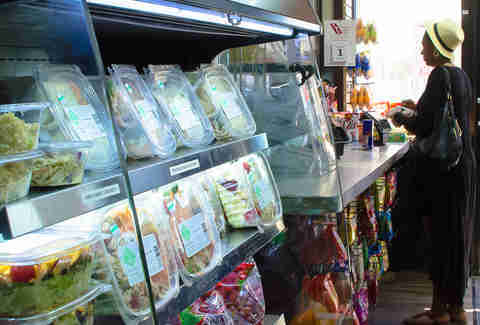 Today Fresh Corner Café supplies those same retailers with fresh, healthy, grab-and-go prepared meals and other nutritious snacks while also providing pop-up markets, self-serve refrigerated vending in workplaces, and catering services to a wider demographic of Detroiters. Grocery delivery can also play a role here. 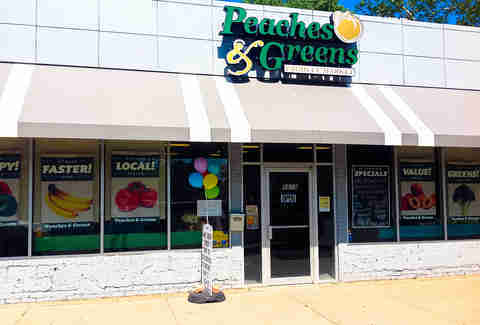 Peaches & Greens Produce Market opened in 2008, and has been serving the residents of Central Woodward in the Midtown, New Center, and Boston-Edison neighborhoods. In addition to focusing on fresh, healthy foods, Peaches & Greens also has a "Produce Mobile Truck," envisioned specifically as a way to address the issue of fresh food accessibility and providing free business and residential produce delivery. She explained that the idea for the truck itself was secondary to the market, and came only after she read about People's Grocery in Oakland, California. They also operated a truck at one point, but shut it down because the model didn't work for them. "I ignored that part and said, we can make it work in Detroit." Detroit's most visible and most nationally recognized symbol of a local food ecosystem is the sprawling 24-acre, 126-year-old Eastern Market. The work Eastern Market has done to cultivate a sustainable food system in the city is almost difficult to quantify (even the USDA approves!). In recent years alone, the Market has introduced several more weekly farmers' markets in addition to its long-running Saturday market; it operates more than 20 mobile pop-up farm stands; it has partnered with local grocery stores to provide healthy food "tasting stations" near produce sections; it has built a commercial kitchen for fledgling food entrepreneurs to launch and incubate their businesses; it provides a variety of nutrition education classes; it accepts SNAP redemptions and participates in the Double Up Food Bucks program; and it supports the Detroit Community Markets. 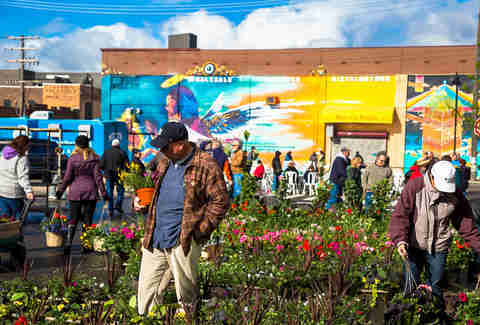 Most recently it has also introduced GROW Eastern Market in 2016, connecting farmers within 125 miles of Eastern Markets to buyers that will distribute their produce beyond Eastern Market to area restaurants and grocers, further supporting the local food ecosystem. In an interview with Crain's Detroit Business, Lynne Brown, program launch specialist and general manager of GROW, said, "The average food travels 1,500 miles to its destination," Brown said. "Our goal is to change that to 50 to 100 miles." 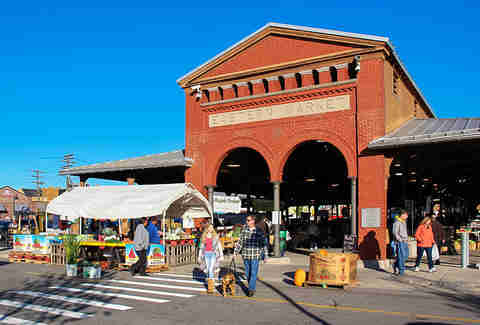 Additionally, food hubs like Eastern Market are the future of the food economy. In a 2013 and 2015 survey of food hubs, the largest national survey of food hubs to date, Michigan State University found that food hubs are financially viable businesses that create jobs and supply food to their communities. So: Is Detroit a Food Desert? Was it Ever? 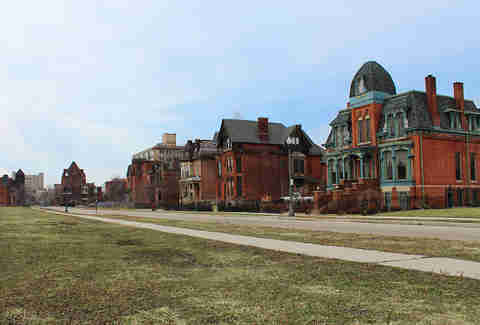 The situation in Detroit is unique, in that the city is 141 square miles large and much of that land mass has been drastically de-populated. By virtue of simple economics (i.e., math), a major grocery store is not going to operate in an area without the population density to support it. Additionally, low-income populations are more dependent on public transit, making corner/convenience stores within walking distance more attractive options for the majority of daily food items than supermarkets farther away. Any conversation about food deserts is completely missing the point if it does not also address basic infrastructural issues: Detroit might have all of the grocery stores it needs, but at 141 square miles and with people living in parts of the city in which their home is the only occupied house for whole blocks, the availability of fresh food matters very little if people have no easy way of getting to it -- and for Detroit, with its glut of vacant landmass and reliably unreliable transit systems, this problem is particularly prescient. With the combined efforts of businesses and nonprofit organizations, fresh, healthy food is more accessible in Detroit now than it has been in decades. Total food sovereignty is still a long way off, and there are more socioeconomic (and, by extension, racial) inequities in the food system as a whole, but Detroit's fight for food equality should be made into a template for other urban areas to follow. So, is Detroit a food desert? If you stand in the middle of any one of Detroit's 1,400 lush, green, abundantly productive farms and gardens, listening to the farmers and other visitors chatter about all the new restaurants and markets opening seemingly every day, it gets kind of hard to keep arguing that case.